Sweet Science is another way of referring to boxing in a scientific manner. It isn’t just fighting; it’s fighting with intellect and knowledge. Sweet Science is the art of hitting and not getting hit. 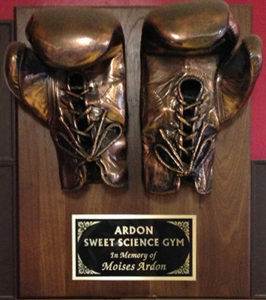 Ardon Sweet Science Gym (ASSG) is a boxing / martial arts gym, where you will not only learn how to fight, but also develop a fit balanced body/mind and lifestyle. The minute you try it, you’ll experience an incredible cardio-workout. You will have fun, while getting into the best shape of your life. We at the gym cater to both the general public, as well as to amateur and professional athletes. We offer semi-private, as well as one-on-one sessions, for males and females of ages 6 and up in Boxing, Kick Boxing, and Mixed Martial Arts (MMA). Our gym is designed to practice the authentic art of boxing and full contact martial arts in a safe, progressive, and stress-free environment. This is a friendly place in a hectic city. It isn’t a commercial establishment like other gyms. Being a private facility, the gym screens everyone who applies for membership. This is done so that both the trainer and the athlete establish a mutual understanding of expectations and goals and to ensure a safe and amicable atmosphere. If accepted, each member is expected to conduct him or herself in a respectful and courteous manner. Negative and disruptive behavior is not tolerated at our camp.